Figla's concept cleaner robot tackles a lot more than dirty floors. Japan's latest cleaning robot not only has the dust-busting muscle to put Roomba to shame but it also includes a video camera, Wi-Fi and can humbly apologise to anyone whose feet it gets under. 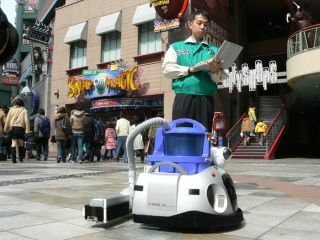 The nameless robot (it's simply labelled 'Multipurpose Network Service Robot') created by Figla and on show as part of the Robot Laboratory project in Osaka, ostensibly acts as a floor cleaner but is really all about proof of various concepts ahead of commercial production. Using combinations of infrared, gyroscopes, bumper sensors and ultrasonics, the droid can navigate uneven terrain as it scrubs floors with its dustpan and brush, spotting and avoiding obstacles along the way. If any of those are deemed to be human, and therefore worthy of ultra-polite Japanese respect, the little fella knows just the right words to use to greet all comers. With the niceties (and the loiterers) out of the way, cleaning recommences. As for non-verbal communication, the onboard camera uses Wi-Fi to relay video back to a screen or control station, whether fixed or on a PC that's being used to feed instructions or monitor progress. With the versatility to perform other tasks - the Osaka demonstration has the robot waxing floors as well as cleaning them - Figla's machine could be a success when commercialized some time next year. Pricing is unclear so far but should be around ¥1 million (£4,320).